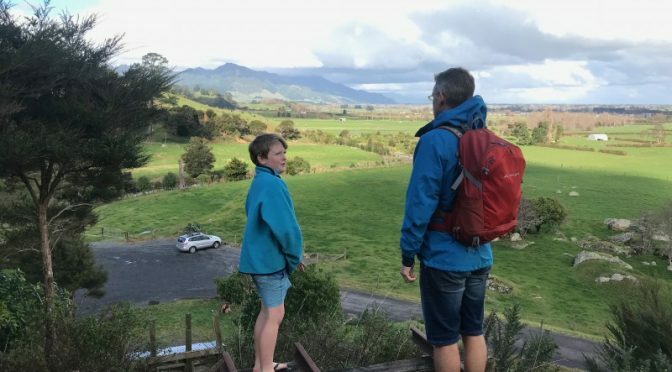 I spent a lot of time as a child looking at the Kaimai ranges as we drove to Tarawera to camp and kayak and I always knew those mountains held lots of adventures. 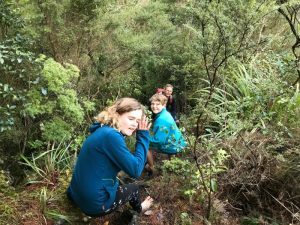 With an extra day off on our weekend in Rotorua and after an early morning mountain bike ride we decided to explore a small part of the Kaimais on the way back to Auckland, and what an adventure it was. 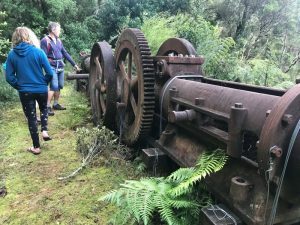 The Waiorongomai Valley Walk (near Te Aroha) explores tramlines from gold mining days and follows New Zealand’s oldest known railway (1882-83) with the original rail still in place. 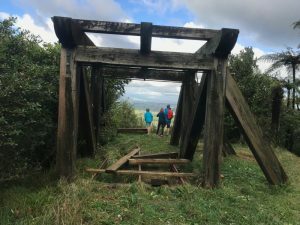 There are lots of different options for walks to explore the area including walking up the inclines ( where the ore trolleys used to be lowered down ) which is a great way to experience the amazing engineering feats of the early settlers. Near the head of the valley we turned for home and descended down a steep hill that had a warning about the descent being steep but unfortunately it didn’t say that there was a ‘stream’ crossing at the bottom that wasn’t passable after heavy rain and it had just rained heavily the night before. 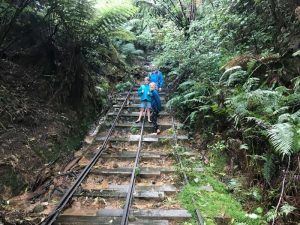 And then the real adventure began as we decided it was too dangerous to risk the second river crossing and had to head back up the steep hill before walking out on an unofficial side track that was pretty rough. Luckily we had our torches as we ended up walking out the last part in the dark. Quite a lot of adrenalin spent. Such a great spot to explore – just watch out for those stream crossings. And yes the Department of Conservation website did mention stream crossing but there are lots of walks in the area and its hard to hold all of that information in an already crowded brain. In hindsight it was quite an important piece of information to remember, and I would like the Department of Conservation to add it to the sign that warns about the steep descent.